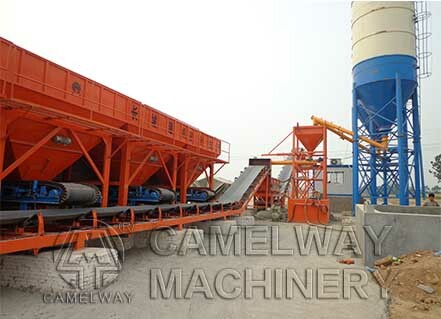 Zhengzhou CamelWay Machinery is a professional manufacturer and supplier of concrete batching plants. As a China-based professional hopper concrete mixing plant manufacturer and supplier, the company would like to tell you the role of transportation equipment in concrete mixing station. First is the belt machine, used for transporting coarse and fine aggregate, suitable for field loose, high degree of automation of mixing plant. Followed by forklift, in large concrete mixing station, the coarse and fine aggregate shovel into the bunker, easy to assist other transport machinery. In small mixing station, forklift truck can be used as main feeding machine. The third is the pneumatic conveying pump with compressed air making cement and fly ash from the bulk cement vehicle into the cement silo. The fourth is the screw conveyor, which is the main equipment of cement and fly ash transport. Screw conveyor in a sealed pipe conveying, basically not affected by the outside world, better guarantee the quality of raw materials. If you are interested in the concrete batching plant, please contact us at any time, or leave a message, we will give you a reply in 24 hours. This entry was posted in Solution, Sri Lanka Batching Plant and tagged concrete mixing station by camelway. Bookmark the permalink. What Are the Models of JS Concrete Mixer? What should be paid attention to in the use of concrete mixing station?